According to the New Testament, Mark was a cousin of Barnabas and accompanied Paul and Barnabas on their first missionary journey. He was also a companion of Peter (1 Peter 5:13). By the second century Christian writers identified this Mark as the author of the Gospel that bears his name and as a faithful interpreter of Peter, his apostolic source. Mark, these histories tell us, was born in Cyrene in Cyrenaica (modern Libya). His family immigrated to Jerusalem about the time Jesus began his public ministry. His mother dedicated significant resources to Mark’s education, and he was well versed in Hebrew and the major trade languages of the day—Greek and Latin. Mark’s family had close ties to Jesus and the disciples, who used their home a number of times: for the Passover meal, as a hiding place after the death of Jesus, and as a meeting place for prayer at Pentecost. Following the missionary journeys described in Acts, Mark visited Rome during Paul’s first imprisonment. Not long after, Mark returned to his birthplace—sharing the Gospel, performing miracles, and establishing the church in Libya. Next he traveled to Alexandria where he evangelized Anianus, a local craftsman, who was baptized along with his family. The church in Alexandria quickly expanded. Sensing danger from pagan opposition, Mark ordained Anianus as bishop and three others as presbyters before departing. After the death of Peter, Mark wrote “his” Gospel and then returned to Alexandria. Shortly thereafter Mark was martyred. He was dragged through the cobbled streets of Alexandria until he died (April 26, AD 68) and then was buried in a cow pasture that later became the site of the most important church in Alexandria. How accurate Eucherius’ story was, modern scholars question. But as he tells it, Maurice was the commander of the legion stationed in the garrison of the Egyptian city of Thebes. Around AD 285 Emperor Maximian Herculius of Rome ordered the legion to march to Gaul (modern-day France and most of Switzerland) and join in suppressing a peasant revolt. Maurice and his soldiers succeeded, and the emperor ordered all his troops to offer sacrifices to the Roman gods to commemorate their victory. His order included the killing of local Christians. The legion under Maurice’s leadership refused to comply; they withdrew near the Roman town of Agaunum (now the Swiss city Saint Maurice-en-Valais, named for Maurice). Outraged, Maximian ordered that every tenth soldier be killed. They still resisted, and Maximian ordered the remainder of the unit—over 6,000 men—to be executed. They replied: “Emperor, we are your soldiers but also the soldiers of the true God. We owe you military service and obedience, but we cannot renounce Him who is our Creator and Master. . . .
Their martyrdom was celebrated throughout Europe. Agaunum became a pilgrimage site, and in 515 King Sigismund founded an abbey to commemorate the martyrs. In the thirteenth century a statue of Maurice was erected at the Cathedral of Magdeburg. Both the Coptic Orthodox and Roman Catholic Churches honor him as a saint today. Alexander, bishop of Alexandria, noticed Athanasius (born ca. 295 in Egypt) playing on the beach, virtually adopted him from his Greek-speaking pagan parents, and thereafter supervised his education. Young Athanasius attended the Council of Nicaea (325) as Bishop Alexander’s secretary. After his mentor‘s death in 328 Athanasius was elected bishop of Alexandria. His hasty ordination raised the suspicions of his rivals, who claimed it was invalid. The challenges were repudiated at an Egyptian synod held in 338. But controversy plagued Athanasius throughout his ecclesiastical career. Soon after his ordination his adversaries within Egypt formed an alliance with prominent opponents outside of Egypt. The alliance brought charges of illegal and immoral conduct against Athanasius in the court of the emperor. Initially, Athanasius successfully defended himself against these charges, but later he was ousted at the Council of Tyre and exiled to Trier (Germany) by Constantine. Soon after the death of Constantine, Athanasius was allowed to return, but it was short-lived. Again he was forced to leave, this time fleeing to Rome. Over the next three decades Athanasius was exiled five times by four different emperors. His last exile ended in 366, after which he remained in Alexandria until his death on May 3, 373. Athanasius’s theological influence on core Christian doctrines—the nature and divinity of Christ, the nature of salvation, the Trinity—are well documented. Typically underreported is his ability to win the hearts and minds of those he encountered. During his exiles in Trier and Rome, he won support from western churches. He also gained the personal loyalty of influential monastic communities in Upper Egypt, which resulted in their defense of Nicene authority, despite their suspicion of ecclesiastical authority and the pageantry of imperial churches. Meletius, the bishop of Lycopolis in Egypt, was concerned about those who had lapsed during the Diocletian persecution. He considered the standards of readmission set by Peter, the bishop of Alexandria (ca. 300–311), far too low. Whether concerned for pastoral oversight or motivated by more exacting standards, Meletius ordained clergy, even outside his jurisdiction, who supported his more stringent view. Some called them the Church of the Martyrs. His actions were seen as an attempt to undermine the authority of Peter, who promptly excommunicated him. This split persisted after the persecution ended in 313. 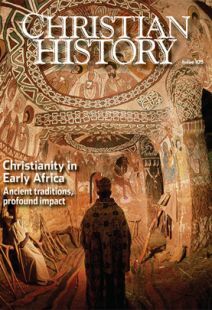 Michael Glerup is executive director of the Center for Early African Christianity.